Located next to the Hungarian border _ some 180 kilometers (112 miles) to the north of Belgrade _ Lake Ludas harbors a vibrant ecosystem teeming with freshwater life, ranging from fish to insects to aquatic plants. Some of these plants _ the hydrophytes _ rely on sunlight to survive. By extension, all other life forms inhabiting the lake are also dependent on the photons beaming from our closest star, as flora form part of the bottom-most rung of the food chain. To aid in the process of photosynthesis _ by which plants transform the Sun's energy into sugars synthesized from carbon dioxide and water _ employees of Serbia's Palics-Ludas public company wielded chainsaws and other heavy machinery to cut precise holes in layers of ice 20 centimeters (eight inches) thick that cover the lake. 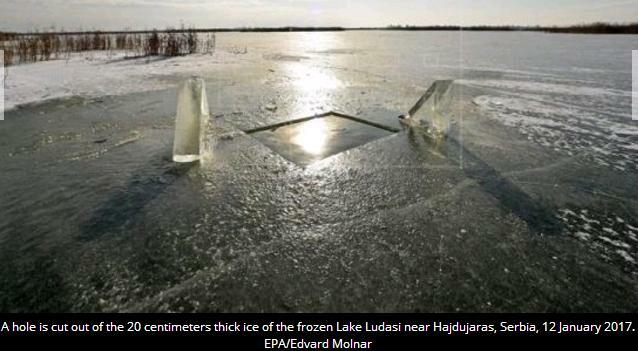 In the cold winter months, the lake's surface reaches freezing temperatures and gets coated by ice so thick it obstructs the passage of light. Lakes freeze from the top down, with the ice staying afloat because of its lower density. The holes allow sunlight to directly shine onto the lake's chilly waters, making life much easier for algae and the organisms that rely on them for nourishment. Lake Ludas, a special nature preserve, was designated a swamp area of international significance by the Ramsar Convention on Wetlands in 1977 and obtained its name from the Hungarian word for "goose."